Special ticket price now only £39!! We Shona Munro from Skin Elixir, award winning makers of 100% natural, organic, vegan skincare and award winning chef and fermentalist, Dena Smiles of Probiotic Love warmly invite you to our four hour well-being retreat, taking place on Sunday 24th June, 11-3pm at Primary, 33 Seely Road, Nottingham. You may purchase any of the three separate wellbeing masterclass workshops, labelled workshop 1, 2 or 3 and or the lunch. Each are priced at £10. Upon checkout you will be prompted to select you workshop(s) preferences from the drop down lists. 11.45-12.30 Workshop 2: Select from any of the six workshop options from the drop down list. Experience a different kind of Sunday - four hours away from it all to reset and rejoice in YOU with a host of restorative wellness workshops, yoga and a scrumptious vegan lunch prepared for you by award winning chef, Dena Smiles, formally mains chef at Best Vegetarian Restaurant in England, Cafe Roya! 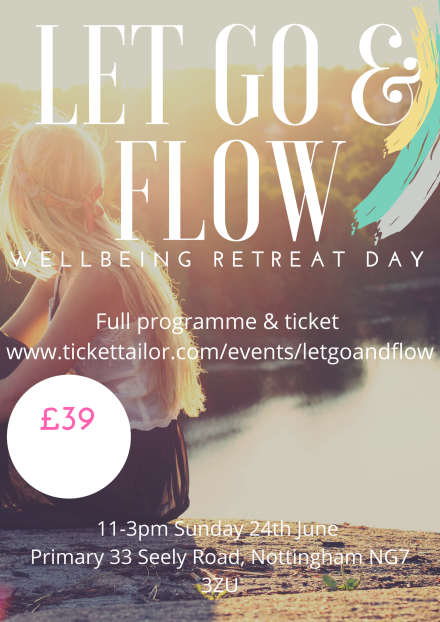 This is a celebration of some of Nottingham's finest well-being practitioners and is set to be fun, revitalising and a superb midsummer treat! So if you're looking to share memories with friends or a special treat day with a family member this is it! Our specially selected practitioners are all passionate experts in their respective fields. A peek into the day....Perhaps a 45 minute exploration into the power juicing with Aloe? Maybe your bag is make-up masterclass or a look into visual art; a foray into what it takes to get your skin in tip top condition, weights or fitness might be a goal, perhaps you are wanting to get a routine off the ground? Each will deliver three x 45 minute rolling workshops. MISIA SMITH is skincare expert an advanced Skincare Coach, Holistic & Nutritional Aesthetician and will be running the skincare workshops, she runs Soothe in West Bridgford. She is also Co founder of the Nottingham Women's Health & Well-being Consortium. KATHERINE BELLCHAMBERS-WILSON is an expert in Herbal Medicine, a member of the National Institute of Medical Herbalists. Her specialism is in female hormonal health. She will be running the practical herbalism workshops with takeaways. RACHEL HINTON is a qualified Kundalini Yoga and Dance practitioner and will run the Kundalini yoga workshops. FIONA MORRIS is a Hatha Yoga expert running multiple classes in and around Nottinghamshire with her business, Yoga with Fiona. For the visual art workshops we have CELINE SIANI DJIKOUA is a visual artist and jewellery maker, her most recent exhibition was 'STAND UP'. Personal Trainer and 'Women with Weights' trainer, CHERRY MARS aka The Booty Controller will be delivering the weights workshops. She is an amazing motivator and fitness and strength will be the focus of her workshops. HANA NEMOS juicing expert. He runs business, Aloe Nottingham. His workshops will focus around incorporating healing and nurturing Aloe Vera into juices. He will be giving demos and tasters in his practical sessions. Peach Berry Make up Artist. EMMA BERRY is an accomplished make up artist, working in theatre, film and most often bridal makeup. We look forward to welcoming you to what will be a superb multi sensory retreat day.